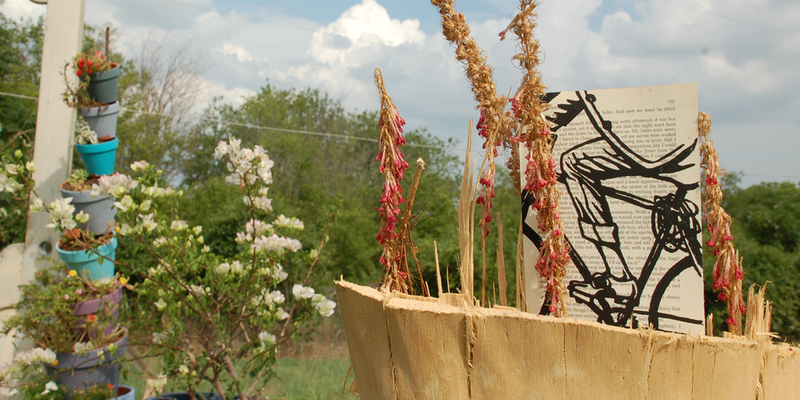 What is a Wood Block Print? Think about a stamp pad. -A stamp is a block with a carved/raised image on one face of the block. -When you press a stamp to an ink pad the ink remains on the raised surface of the stamp. -When you press the stamp down on paper only the raised portion touches the surface. -The ink stays on the paper and creates a reflection of the raised surface of the stamp. A wood block print is essentially the same thing. Of course it's a little more complicated than that but now you have the basics. The process for Sunflowerman is a sort of bastardization of the tradition but stays true to the essence, to the heart of hand-crafted prints. Much of the art in a wood-block print is the crafting of the 'stamp.' It is in designing the image and the meditation of carving. please do not do as I do, do as I say. Never! carve toward your leg! Drawing and designing consumes the first stages. Some people are confident enough to attack their wood-block with the freedom and vigor of a child learning to walk. My vigor is spent in my sketchbook. The meditation of carving the wood-block is a transcendent experience. Funny enough it is similar to washing dishes, mowing the lawn and sitting in silence. The resistance of the wood against the sharp edge of the carving tool is akin to biting into a freshly picked Golden Delicious apple in the cool of a Michigan morning. Part of the art in carving is leaving 'chatter' marks, or lightly raised surfaces that aren't part of the design but show in the final print. Rolling the ink is a technical feat of mastery. I am merely adequate. It takes years of practice to develop the knack for rolling ink. This may be one of the most important tasks in the wood-block print process. If a print needs to be carved more it can be carved more, but it is nearly impossible to re-roll ink on a print, you just have to do it over and scrap the mistake. The Home Wood Block Print tutorial gives a great and simple description of how to roll ink. Printing the block continues my obsession of Fashion Art on book pages. 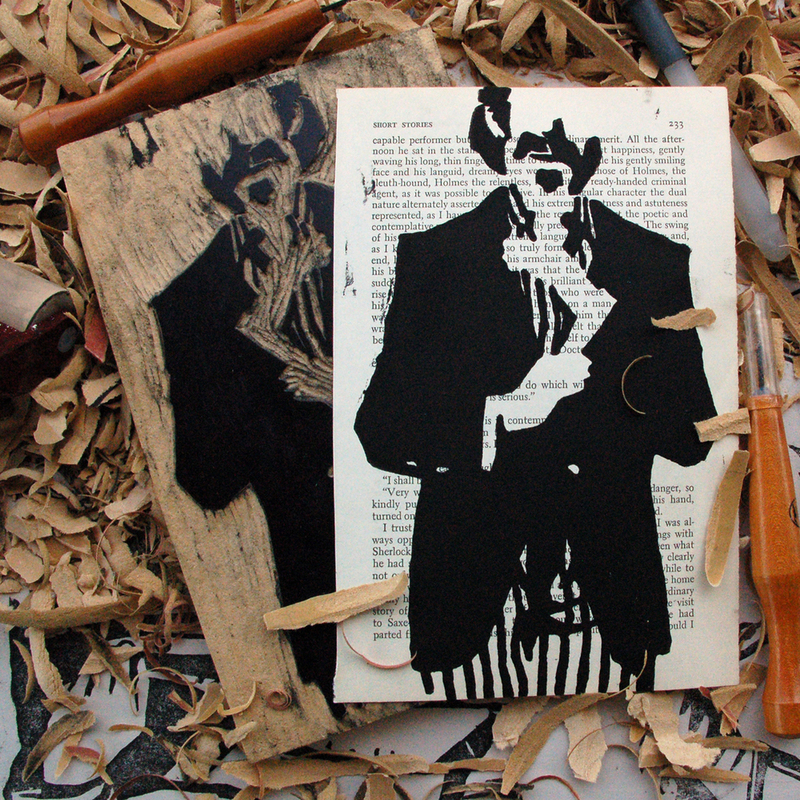 I pulled more pages from my collection of Sherlock Holmes stories to make this series of fashion illustration wood-block prints. Matching the pages to the wood-block proved simple. It was all in the planning. I made the wood blocks match the size of the book pages to create prints that were flush to the edges. I created 5 wood block prints for this first print collection. Wood-Block printing, especially in the most traditional ways, is an expensive process but the cost is worth every moment of joy and despair. Printing is an emotional process, mimicking the ups and downs of life. There is planning, executing, hoping, succeeding, failing, failing, failing, succeeding, failing and all throughout the meditative experience cleanses the spirit and mind. At times the process can be hours and other times it can take months to perfect the print or to be satisfied with the result. 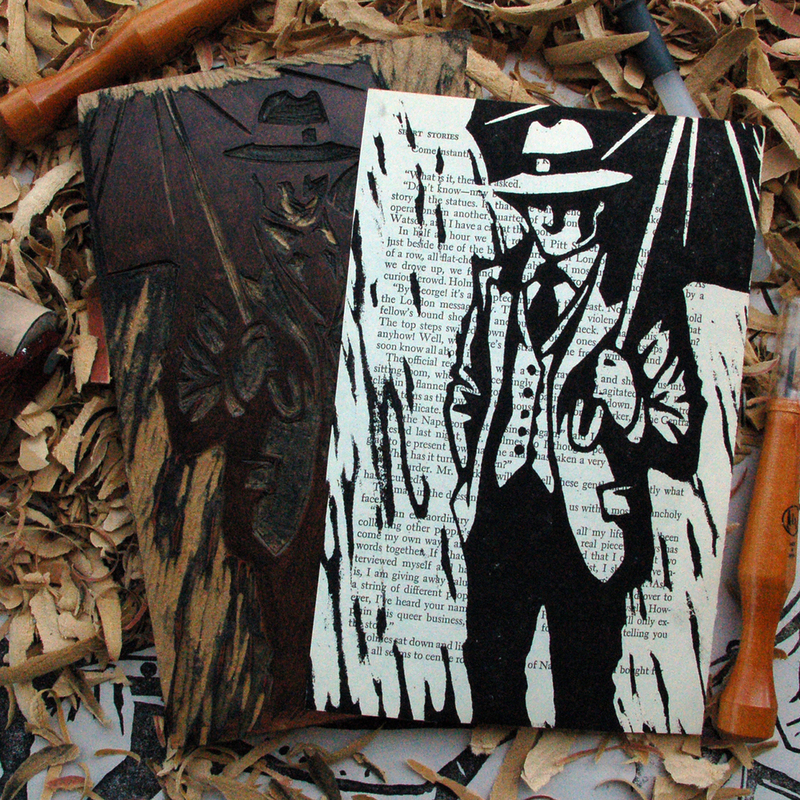 I'm glad to bring the practice of fine art wood-block printing to fashion illustration.